Last week, I had the opportunity to visit Alaska. The trip included a stop at Lake Clark National Park and Preserve, a breathtaking place where volcanoes steam, salmon run, bears forage and craggy mountains reflect in shimmering turquoise lakes. The four million-acre national park was established to protect the watershed, which in turn supports the sockeye salmon fishery in Bristol Bay. The park also provides for continued subsistence use of the park by local residents, many of whom use the area’s rich resources in traditional ways. Lake Clark National Park & Preserve in Alaska. Photo by J. Mills, National Park Service. The visit was an opportunity to observe both the cultural and natural treasures of this unique area. After touring Port Alsworth, a village of about 200 people, we hiked through boreal forest to Tanalian Falls and Kontrashibuna Lake, taking in a view of gorgeous Lake Clark. Along the way, I saw many improvements to the historic trail system made by local youth crews over the last few years. These young people are doing tremendous, exciting work, and their dedication and accomplishments demonstrate the potential of an empowered youth. At Interior we realize that not everyone has a national park in his or her backyard, but we must ask the question: If there is a forest, or a lake, or a habitat for wildlife, how can we protect it for future generations? The Obama Administration is committed to building the next generation of conservation leaders and inspiring lifelong stewardship of the environment by engaging young people in hands-on service to our public lands and waters. 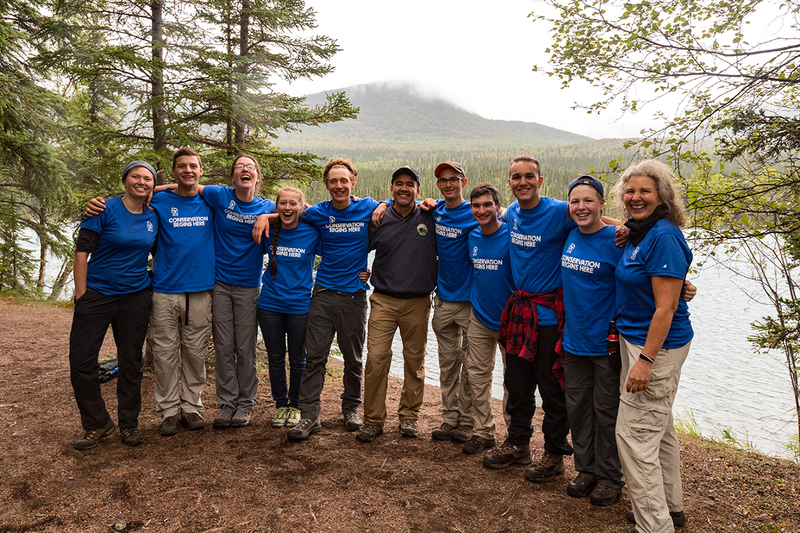 Deputy Secretary Connor poses with a group from the Student Conservation Association at Lake Clark National Park & Preserve. Photo by Tia Vaughn, National Park Service. In support of this important priority, we launched Every Kid in a Park, an initiative to connect more young people with nature, and supported initiatives like the Arctic Youth Ambassador’s program, which brings diverse youth from across Alaska to serve as ambassadors for their communities and country. Interior has also encouraged a surge of youthful energy into the environmental and recreational fields. As of 2016, we produced 53,000 jobs for young people and veterans across our public lands and waters. At Lake Clark National Park and Preserve, almost half of the staff is under the age of 35, bringing a diverse set of experiences to the park in their role as public servants. Many are participants in the National Park Service’s NPA Alaska Academy internship program which, in partnership with the Student Conservation Association, is providing valuable business and outdoor skills and conservation training, as well as teaching them about the subsistence way of life that is so important to many Alaska Natives and non-Native Alaskans. These dynamic young people are indeed becoming future champions and protectors of our public resources. 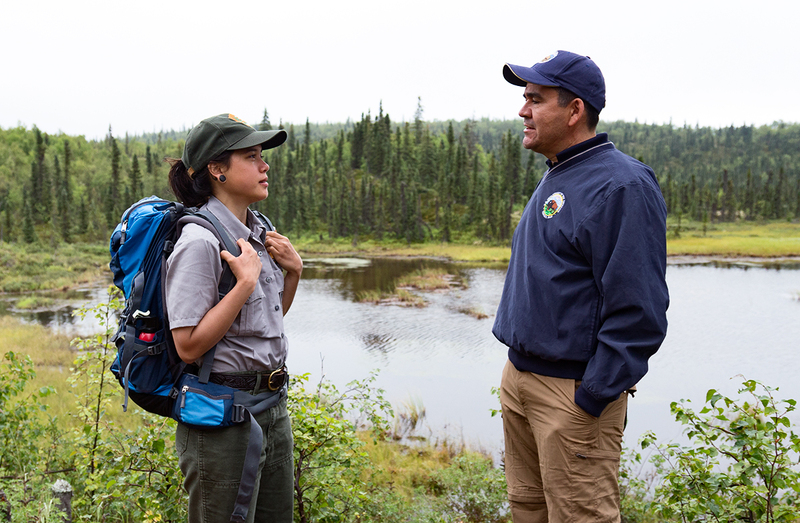 Park Ranger Tia Vaughn tells Deputy Secretary Mike Connor about her first season working at Lake Clark National Park and Preserve. Photo by National Park Service. 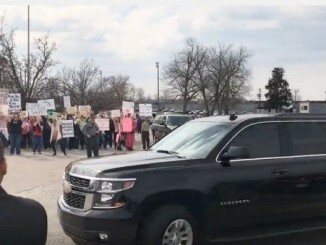 Statistically, more and more youth are spending their free time inside in front of glowing screens, disconnected from nature. But for the young people we met in Alaska who were part of youth crews making improvements along the Kontrashibuna Lake or working on fish crews, spending time outdoors is one way to reconnect with their traditional way of life. The Arctic Youth Ambassadors Program, which is also based in Alaska, was established by Interior’s U.S. Fish and Wildlife Service and the U.S. Department of State in partnership with the nonprofit Alaska Geographic to increase outreach and education in the region. For the youth who take part, being outdoors is an important part of their livelihood and a crucial part of their mission. Over the course of the two-year program they share their own perspective on Arctic issues, build awareness at home and abroad about the impact of climate change, and bring their voices into a global conversation about how to sustain communities, cultures and the environment in a changing Arctic. 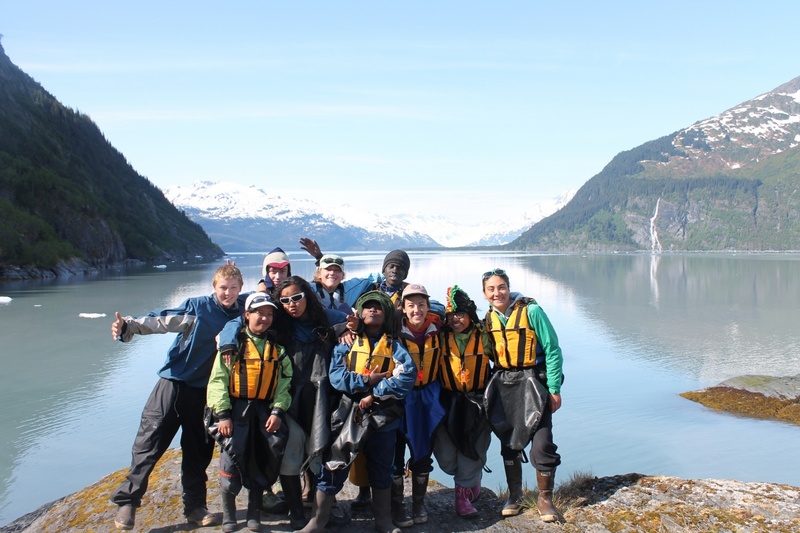 Arctic Youth Ambassadors in Alaska. Photo courtesy of Reth Duir. Some of these young ambassadors are also working hard to preserve Alaska Native traditions, cultures and values. One way they are raising awareness of their work is by writing about their personal experiences, whether it’s protecting one’s community against climate change, or ensuring that Yup’ik culture is sustained for generations to come. These passionate, personal stories truly highlight the importance of youth involvement. During the trip to Lake Clark, I heard about how Alaska’s indigenous inhabitants have relied upon the traditional harvest of wild foods for thousands of years and have passed this way of life down through generations. Even today, subsistence fishing and hunting provide a large share of the food consumed in rural Alaska. The state’s rural residents harvest about 18,000 tons of wild foods each year – an average of 295 pounds per person. Fish make up about 56 percent of this harvest statewide. Subsistence has also become important to many non-Native Alaskans, particularly in rural Alaska. 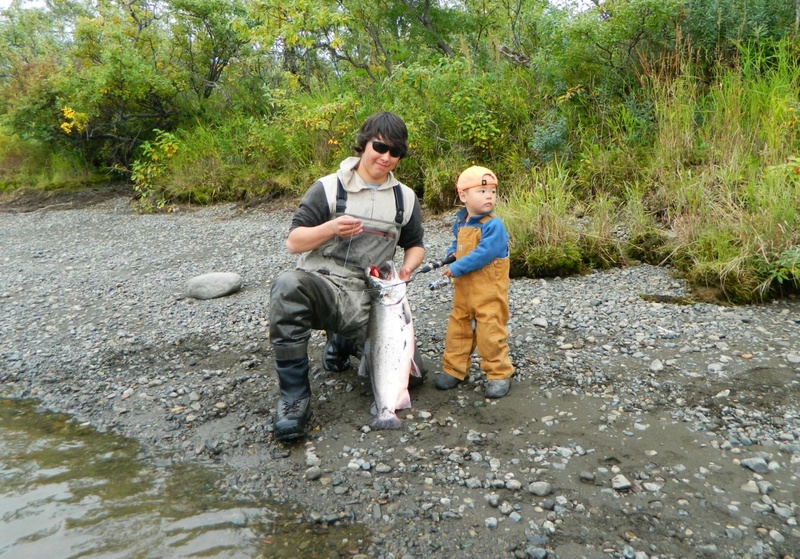 Arctic Youth Ambassador Keemuel Kenrud fishing with his little brother in Alaska. Photo courtesy of Keemuel Kenrud. In this unique part of the world, dependence on wild resources is cultural, social and economic. Interior does valuable work to protect both these resources and the ways of life based on them, and with motivated and talented youth, we know this work can continue well into the future.